For the eighth consecutive year, WKU has been designated a Military Friendly® School by Victory Media, publisher of G.I. Jobs®, STEM JobsSM and Military Spouse. First published in 2009, Military Friendly® Schools is the most comprehensive, powerful resource for veterans today. Each year, the list of Military Friendly® Schools is provided to service members and their families, helping them select the best college, university or trade school to receive the education and training needed to pursue a civilian career. Earlier this month, WKU earned national recognition in Military Times’ Best for Vets rankings for the seventh straight year. The Textbooks For Troops program has assisted more than 200 students this semester and more than 1,600 students since the program started. WKU Military Student Services provides other services, including support and guidance with GoArmyEd and tuition assistance requests for all branches of the military; and a Veteran Resource Center, a dedicated space for military, veterans and dependents located at Tate Page Hall 410 on the Bowling Green campus. The Student Veterans Alliance, a coalition of student veterans helping each other succeed, uses the space for monthly meetings, as well. A Military Student Services center opened in 2015 at the WKU Glasgow campus. WKU also offers unique services to its military students that are not available at any other university in Kentucky: a discounted tuition rate of $250 per credit hour to all active duty, reserve and National Guard members; and the only therapy dog, CanDoo. WKU has the only Veterans Upward Bound program in the state, an award-winning Army ROTC program, an Air Force ROTC program, and its Office of Veterans Affairs serves more than 800 students utilizing the GI Bill. WKU is also a Yellow Ribbon and MyCAA participating university. WKU also serves the Elizabethtown-Fort Knox community by providing classes and student support services on post and at the Elizabethtown regional campus. 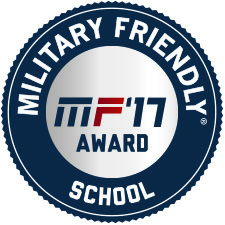 Institutions earning the Military Friendly® School designation were evaluated using both public data sources and responses from Victory Media’s proprietary survey. More than 1,600 schools participated in the 2017 survey; 1,160 were awarded with the designation. More: WKU to observe Veterans Day on Nov. 11.